A loan of $1,875 helped a member to stock grains for five months and then sell. Sékou is a member of the group Kotognogotala. He is Malian, 51 years old, and uneducated. He is the one with his hands on a sack of peanuts. A married father, he has nine children, aged 2 to 18 years old. Four of them attend school. His wife is a homemaker. Sékou has turned to RMCR to be able to carry out his work. He stocks grains; that is, he buys grains (millet, sorghum, corn) at low prices, and when prices rise, he resells to make a profit. He has been running this business for a long time. A creditworthy client at RMCR, he is very happy with this business, thanks to his lucrative advantage. He is totally serious about succeeding. He buys and sells at the local market. The profit will help him to cover family expenses. For the future, Sékou wants to have a bigger loan to be able to increase his business’ volume. Sékou est membre du groupe Kotognogotala il est malien, âgé de 51 ans non scolarisé, celui qui a ses mains sur le sac d’arachide, il est marié père de 09 enfants. Ses enfants sont âgés de 2 à 18 ans et 4 enfants fréquentent l’école, sa femme est ménagère. Sékou fait recourt au RMCR pour pouvoir bien mener son activité, il fait stockage de céréales c’est-à-dire il achète des céréales (mil sorgho maïs) a un prix bas, et quand le prix augmente il revend pour avoir un bénéfice. Il mène cette activité depuis longtemps. Un client solvable du RMCR cette activité lui plait beaucoup grâce à son avantage lucratif il met tout le sérieux pour sa réussite. Il fait l'achat et la vente dans le marché localité le profit l’aidera prendre en charges les dépenses de sa famille. Dans l’avenir, Sékou veut avoir un prêt plus élevé pour pouvoir augmenter le volume de son activité. 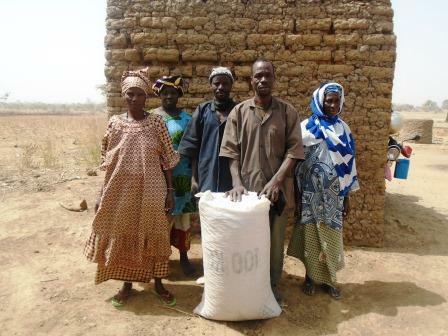 It empowers farmers and entrepreneurs in underserved areas in Mali. This loan is part of RMCR’s solidarity group loan program. Borrowers who have successfully completed several loan cycles with the community bank program graduate to this one and access slightly larger loans in groups of 2-9 members. Group members are mutually responsible for repayments and can access voluntary savings services. Group members can use loans for any income-generating activity. Common activities are farming, raising livestock and commerce. Terms and payment frequency can vary according to borrowers’ business cycles. By supporting this loan, you’re helping borrowers access credit and support each other through the loan process. Réseau de Micro-institutions de Croissance de Revenus (RMCR) is an NGO that provides credit to low-income communities in rural Mali. The organization offers community bank loans, from which borrowers can graduate to solidarity groups, and from there to individual loans. RMCR customizes the loans it offers in order to fit the unique business cycles of livestock, farming, and commerce activities. Kiva supports RMCR’s efforts to reach women borrowers in underserved communities. RMCR’s system also helps borrowers grow and reach new goals, graduating to different levels of loans.